The third of my 4 planned festive dining trips this year (after Solita & Miracle On High Street) was at one of my favourite local restaurants Aumbry. This was my 4th time eating at Aumbry (although admittedly the last was a charity Gruffalo lunch) and it’s fair to say that I love the place. The food is seriously high end, head chefs Mary-Ellen McTague & Laurence Tottingham both trained under Heston Blumenthal at The Fat Duck and they have won several awards since my last visit including being placed 57th in the UK Top 100 Restaurants at the 2012 National Restaurant Awards. 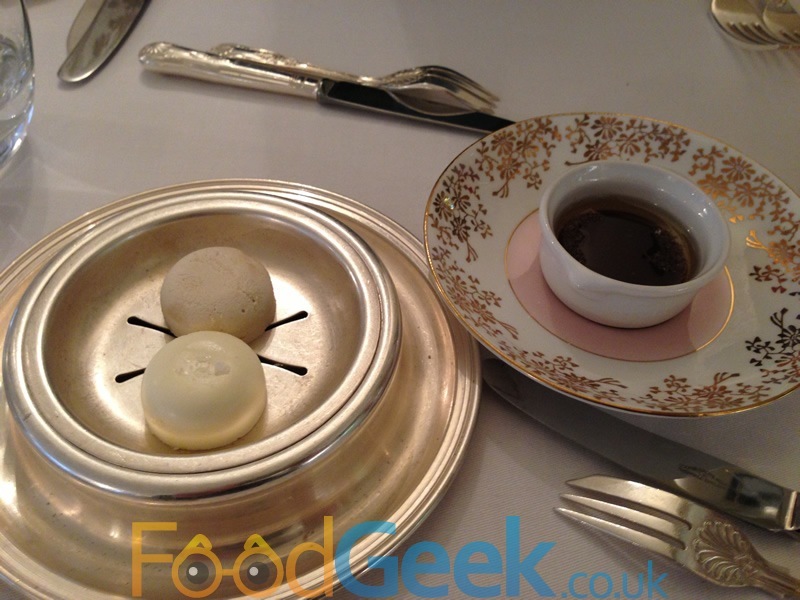 I’ve eaten some amazing dishes at Aumbry and still talk about their black pudding scotch egg and treacle tart a lot! 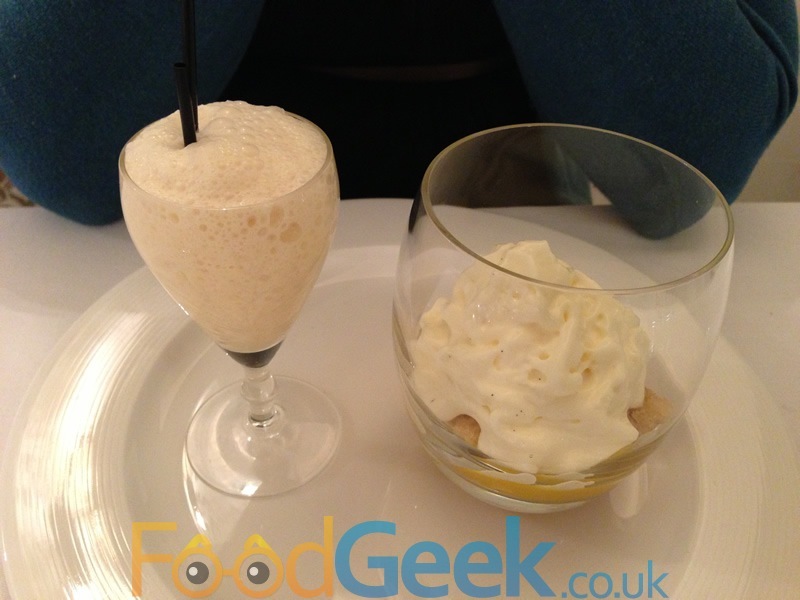 So I was particularly excited by their Festive Tasting Menu and couldn’t wait to try it. Shortly after arriving we were offered a glass of cucumber infused water which was very refreshing and a nice idea. As much as I liked the water I have to admit that the glass of prosecco that followed was even more enjoyable. With the water & prosecco we ate small cheese puffs and homemade crisps which i’ve had on previous visits. They’re very good and a perfect appetiser, tasty but extremely light. 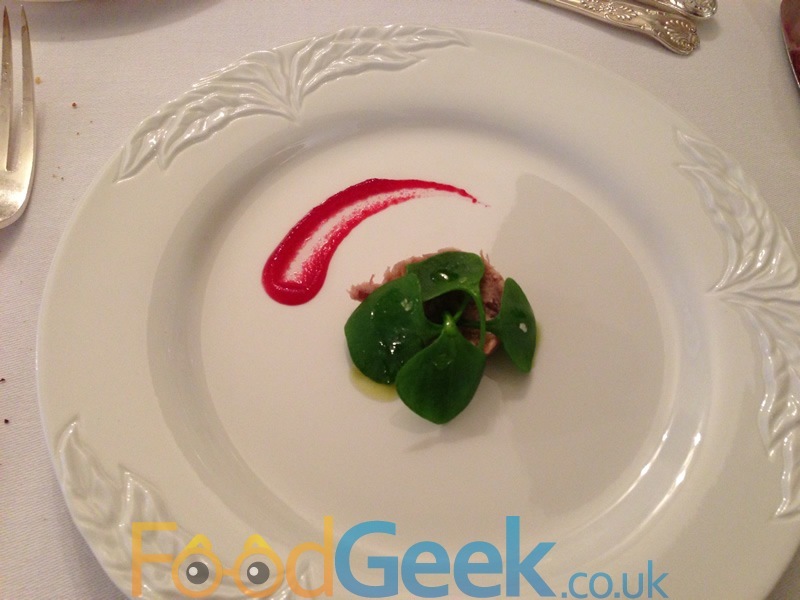 The amuse bouche was potted pheasant with pickled cranberry and crab apple juice. It was only a mouthful but an extremely good one, the soft, rich and meaty pheasant balanced perfectly by the sharpness of the crab apple juice and the cranberry sauce was delicious. 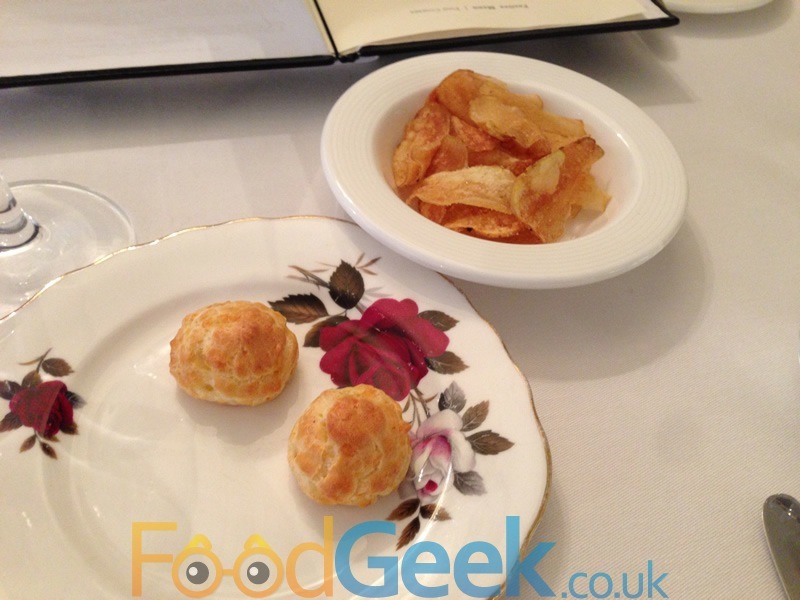 The bread at Aumbry has always been very good and this time was no exception, they also do fabulous butter. Today we had one from a local farm in Bolton (I was told the name but unfortunately forgot) which was good but the other, a nut brown butter was fantastic. As well as the butter we were given a bowl of fresh beef dripping which was unbelievably tasty, although I could feel the fat going straight to my waistline with every mouthful. 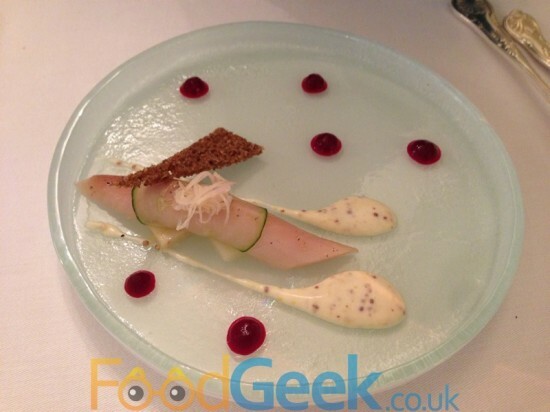 The next course of the official menu was ‘Home Smoked Mackerel, Roast celeriac, pickled beets & mustard cream’. Mrs FoodGeek had this and loved it. I had a taste and it was very good, perfect fish with just the right smokiness, a lovely mustard cream and sweet beetroot. A small slice of rye toast added a texture. 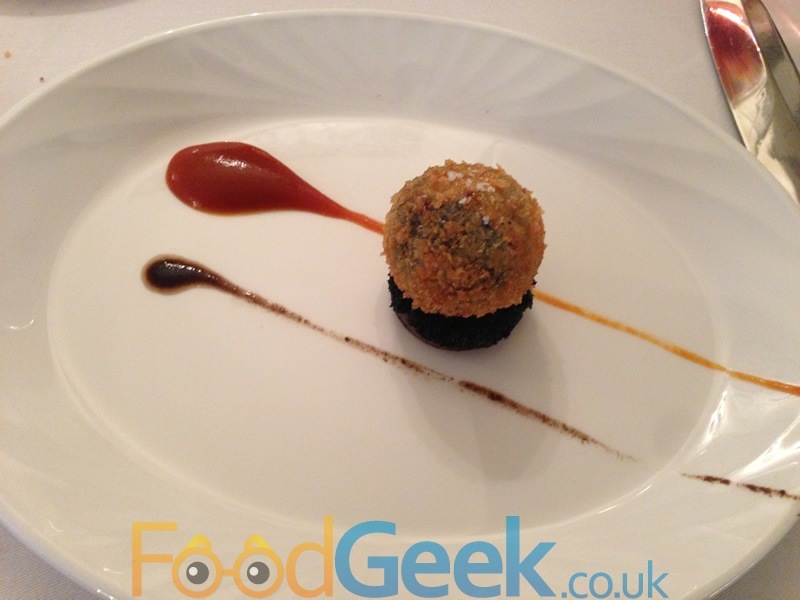 It was a very good dish that I would have been perfectly happy to eat but I couldn’t resist asking if I could swap for one of my all time favourite dishes, Aumbry’s signature ‘Bury Black Pudding Scotch Egg, Tomato ketchup & mushroom relish’. Thankfully they said yes and it was just as good as I remembered. 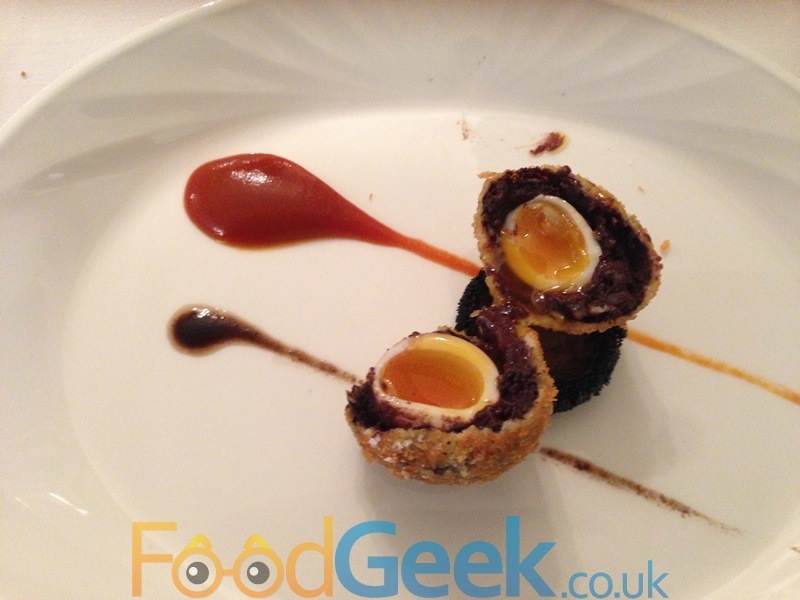 An absolutely perfectly cooked soft & runny quails egg, encased in a layer of delicious black pudding and then golden breadcrumbs. Sitting on a piece of mushroom, served with a homemade tomato ketchup and mushroom relish packed with flavour, still a seriously impressive dish the 3rd time around. The next course wasn’t part of the regular menu but offered as a supplement. It was ‘Scallops with apple puree, bacon crumbs, pork crackling and bacon & lemon thyme foam’. It sounded amazing and to be honest they had me at scallops. 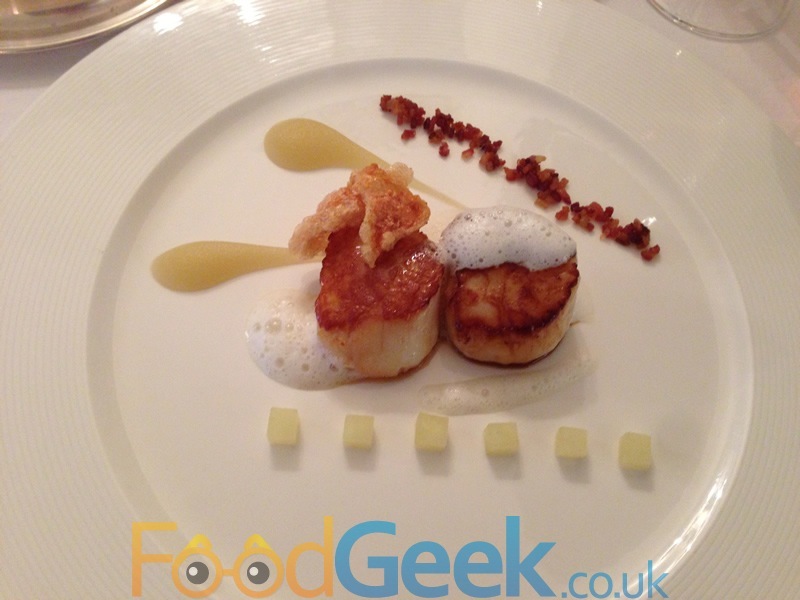 It tasted every bit as good as it sounded, the scallops expertly cooked with a great sear on the outsides but almost translucent in the middle, the pork cracking was amazing and added crunch along with the equally delicious bacon crumbs. Sharpness came from the apple cubes and particularly the apple puree and the bacon and lemon thyme held the whole dish together. A really good addition to the menu. I’ve had good soups at Aumbry on previous visits but this ‘Celeriac Soup, Toasted chestnuts & English truffle’ was the best yet. 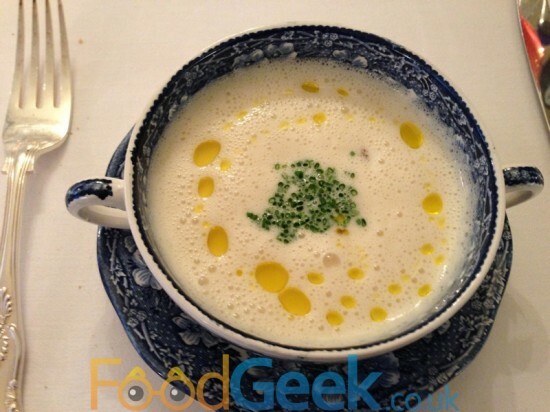 I love celeriac and the soup was full of flavour & silky smooth. The toasted chestnuts had sunk to the bottom and it was such a treat when one was picked up. The soup was finished with truffle oil and finely chopped chives, the flavours all worked perfectly together and was absolutely delicious. The main course should have been ‘A Royal Roast’ which is a three bird roast (duck, pheasant & partridge), stuffing, bread sauce, roast potatoes, sprouts & gravy. 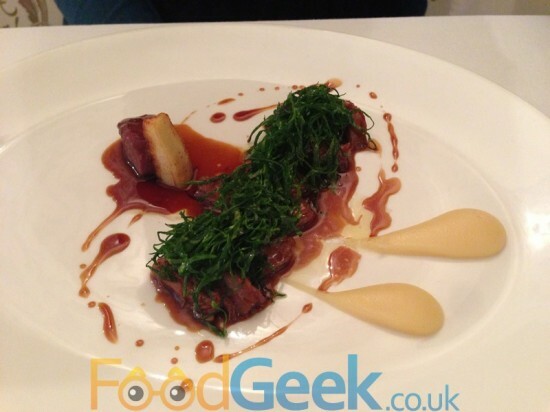 However we were asked if we’d also like to try their Venison dish as well which we gladly accepted. The 3 bird roast was enjoyable but probably the only dish that I could make any sort of complaints about, albeit very minor ones. There was lots good about the dish, it looked beautiful and the sprouts in particular were brilliant, having been shredded and cooked with bacon and chestnuts which is always a winning combination. 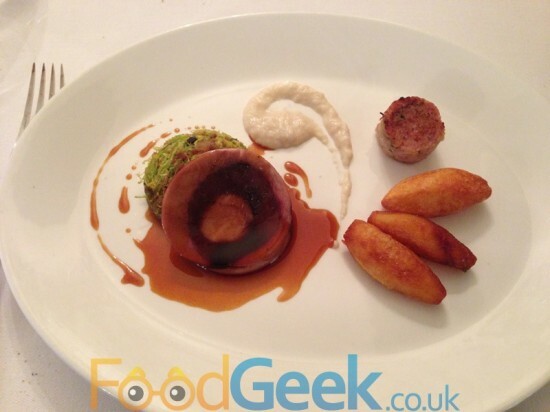 The bread sauce was also excellent as was the gravy although I could have done with a bit more of it on the plate. The roast potatoes had a golden and crisp exterior and a lovely fluffy, soft interior but I felt they could have used a little more seasoning and the meat itself wasn’t quite as flavoursome as I would expect given the birds involved, they also had a strange soft texture which i’m not sure is best suited to a roast dish. The venison alternative however was unbelievably good, ‘Lyme Park Venison, Slow cooked loin, braised haunch, parsley root & sprout tops’. The vension cooked medium-rare was soft and full of flavour, the gravy rich and tasty but the highlights were the parsley root puree which looks like parsnip but is even tastier and the shredded sprout tops which were delicious. A fantastic dish that I’m very grateful for getting the opportunity to try. We were getting very full by this point but there is always room for dessert, especially at Christmas! 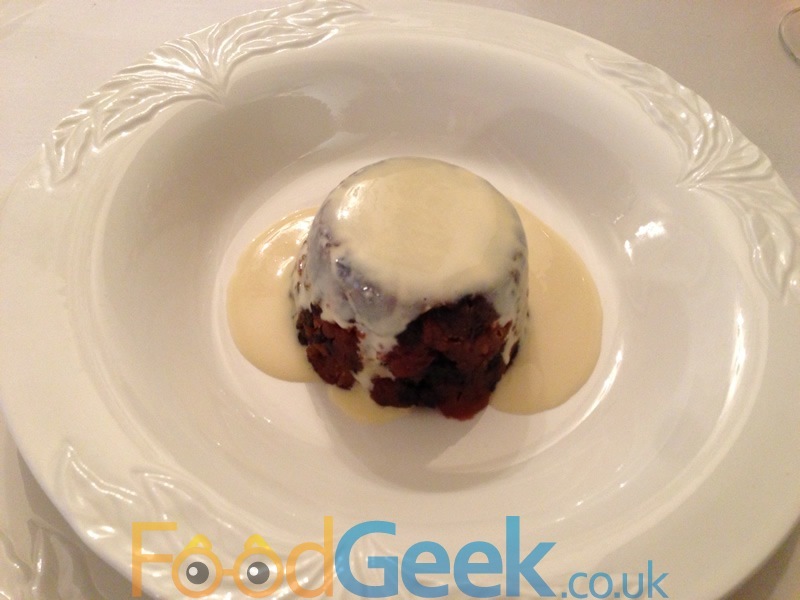 The official dessert was ‘Christmas Pudding with Brandy sauce’. Neither myself nor Mrs FG are particularly fond of Christmas Pudding, she asked to change it for their ‘Sherry Trifle with Mandarin Syllabub’ but I decided to see if Aumbry could convert me to Christmas Pudding. They well and truly did! It was an absolute delight, one of the best desserts I have ever eaten. Packed with fruit and christmas spices and somehow unbelievably light. The brandy sauce was very nice too and a perfect accompaniment, I can’t say enough how much I loved this dish despite expecting not too. The Sherry Trifle was also a success, it was perhaps a bit small but it tasted great. The sherry wasn’t overpowering as is often the case and the balance of flavours was good. The mandarin & thyme syllabub on the side was a lovely flavour combination and also a little bitter to counter the sweetness of the trifle. It wouldn’t be a Christmas feast without a mince pie, although we were extremely full by this point so were very grateful to see how small it was. It may have been small in size but not in flavour, it packed a real punch and is probably the best mine pie I have ever eaten. According to the menu it uses Mrs Beeton’s traditional recipe so I may give it a go next year. It was served with a shot of rum cream with was very light and delicious. 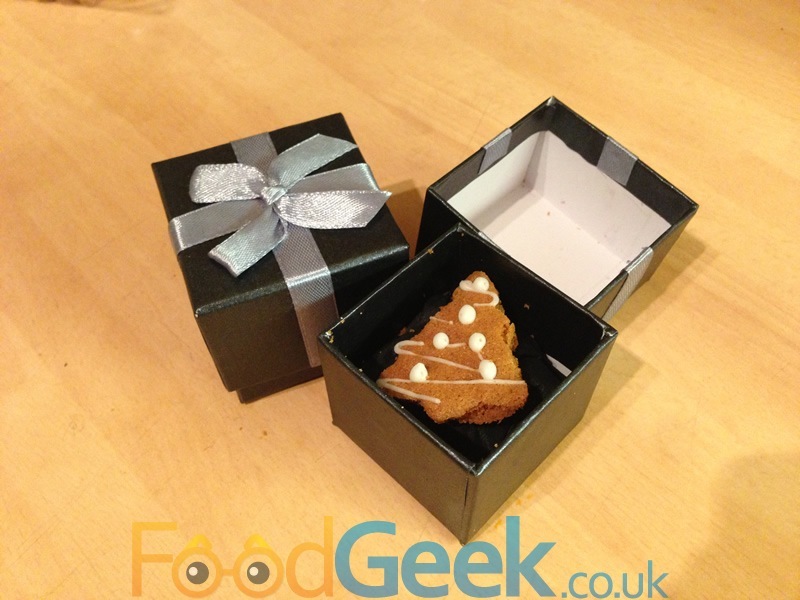 Just as we were about to slump under the table we received some little petite fours, or ‘Gold, Frankincense & Myrrh’. They were a dark and a white chocolate. Unfortunately I ate the white chocolate before taking the photo but I can assure you that it tasted fantastic. It was creamy and delicious and contained popping candy which I often find a little gimmicky but actually worked really well here. 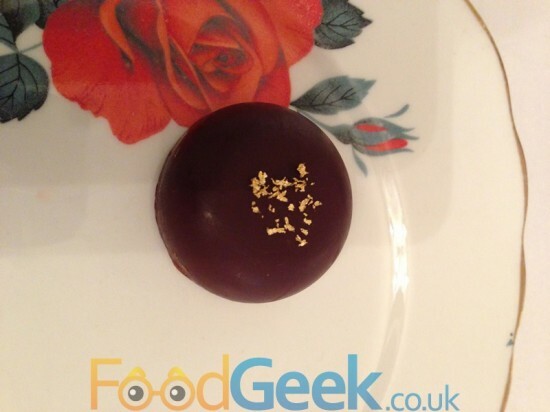 The dark chocolate truffle was deep, rich and delicious too and topped with gold leaf. Every single dish at Aumbry was enjoyable, some truly outstanding. 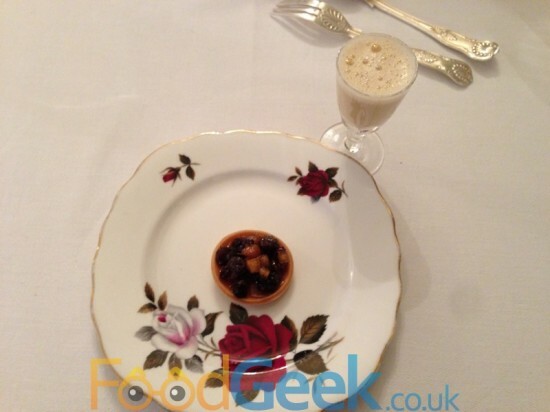 I don’t believe that I will ever have a better Christmas Pudding or mince pie and i’ll be remembering some of the other dishes such as the soup and scallops for a very long time. Service was also immaculate, all of the staff that we dealt with were incredibly efficient and friendly and very knowledgable about the food and menu which impressed me greatly. I hope that this becomes a regular offering at Aumbry as if it is I will definitely be attending every year! As we were leaving we were given two little presents, we were rushing off so didn’t open them until we got home. When we did we found cute little gingerbread Christmas trees inside! They looked too good to eat but eventually we did and they were very nice, crumbly and delicious. Thanks Aumbry and Merry Christmas!